This is the final post in a 5 part series of installing M2Sys Scanning and CheckPoint. Part 2: Why Vein Scanning? In the previous installation steps: evaluating the type of scanning and installing the server and client were documented. Now final step of configuring the scanning client to connect to the database and work with ACS CheckPoint remains. After you have confirmed that the server is operating correctly and you have connected the scanner and installed the driver you are ready to configure the client. 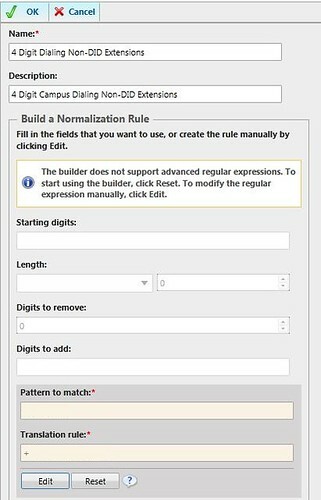 Workstation Configuration MUST be done by a user who has local admin rights, a user with less rights can make the changes but once the settings window is closed all changes are lost. Since these workstations are public machines it is wise to make them as hardened as possible to prevent non-designed use of the workstation. The first step is accessing the settings portion of the application. This is done by clicking on the icon that looks like a finger print in the System Tray (near the clock). 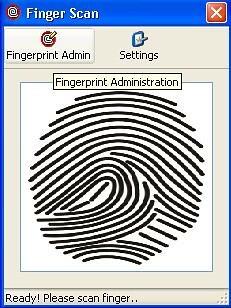 The Finger Scan application will display and you have two options: Fingerprint Admin or Settings. Selecting Settings allows us to configure the client. 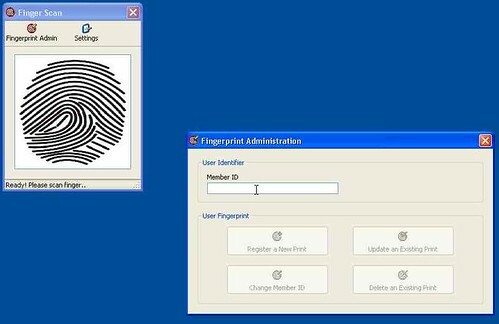 FingerPrint Admin will be used later to capture scans. 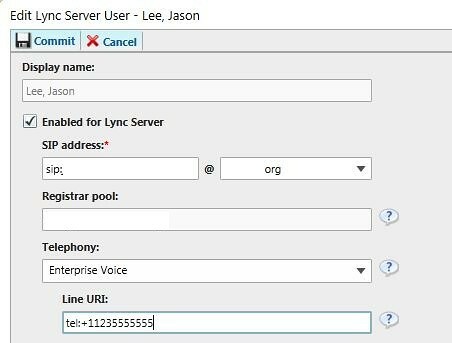 If you are running the server application on a separate machine from the workstation you need to change the Server Address from localhost to the IP address or the DNS name of the server. Note: DO NOT use the Fully Qualified Domain name, only enter the Server Name or the application will not connect. 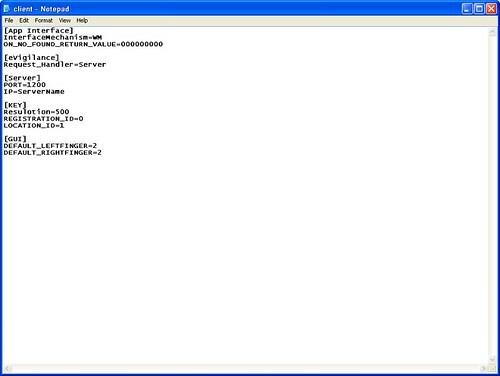 While entering the server name choose how many scans the software will prompt you to capture. 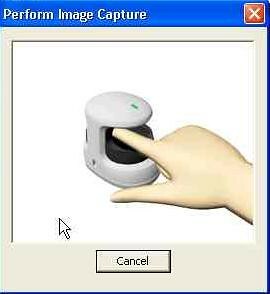 Capturing two scans during registration allows the user to scan a finger on either hand. When you capture two fingers the user can try the second finger if the scan fails to lookup the individual. Changing the value for how long to display the scan notification to a lower value than 5 has helped so when a person’s finger fails to scan for various reasons the right side of the screen doesn’t fill up with failed scan alerts during the check-in process. You can only set one password, and we didn’t want to give the password to change settings to volunteers. It becomes very cumbersome for the volunteers to have to enter a password for registration admin. Volunteers who have access to the workstations that can capture scans don’t really need restricted from accessing the scan admin. At this time the client application has been configured and can be tested to confirm the client and server are communicating. Enter the Member ID for a test. Later once CheckPoint is configured the Member ID is the individual barcode assigned to each person in the database. Enter the Value of the Member ID. 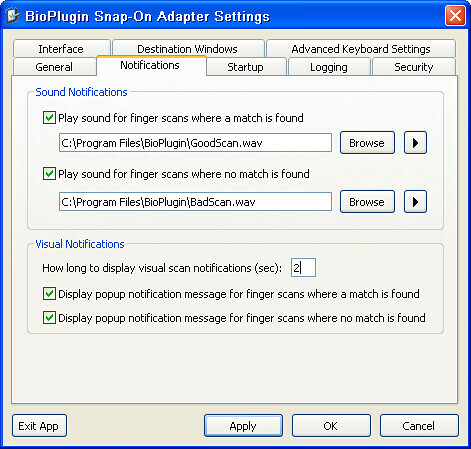 After selecting the finger “Click Here to Capture Finger Vein” and the application will go into capture mode. 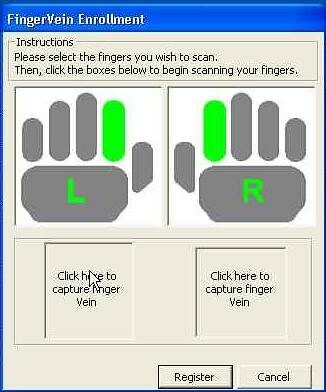 Once the scanner is in Capture mode, the following screen will display until the scanner has captured a vein scan. The individual being scanned should lay the finger completely across the scanner and rest the finger on both the front and back ‘finger rests’ in the scanner. After the scan is captured you will be returned to the previous window. After the scan has been captured close the FingerPrint Administration window. Launch Notepad and scan one of the fingers captured for the test. 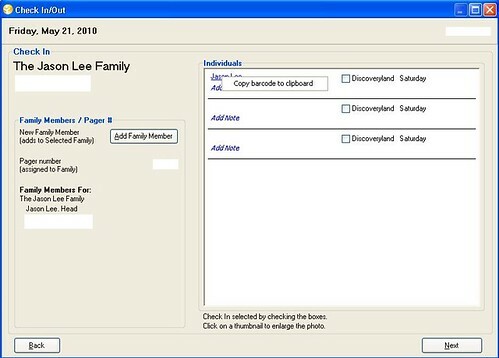 If the system is working correctly notepad should display the value you used when register the test user on the first line and the cursor will move to the next line in the document. After completing the test scan, re-launch the settings window and select Destination Window Tab. Right Click on “My Test Keystroke Destination” and choose Rename. This is not telling BioPlugin where to send the scan, simply naming the destination you are going to define. On Assisted Check-in/out locations it might be a helpful choice to not start minimized since these locations will be used to capture scans and it is helpful to have the application maximized for ease of use. 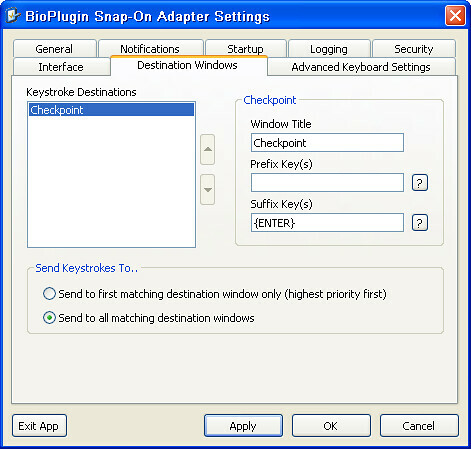 The BioPlugin client is now configured to work with Checkpoint. After the settings are complete restart the kiosk. 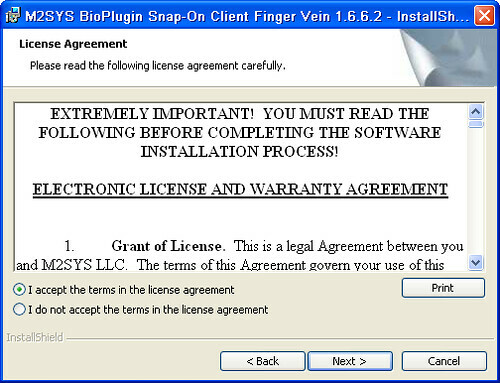 After the reboot, you will be prompted to activate the software license. You will need to login to the workstation as an Administrator to activate the software license. If you purchased the licensing from ACS directly, contact support and provide support the Installation ID and they will activate the install and provide you with the Activation ID. Enter this value and reboot the kiosk. Once the client machine is configured, Launch CheckPoint Express Check-In start a session. Users can now scan their finger and CheckPoint will return the individual/families record for Check-in. 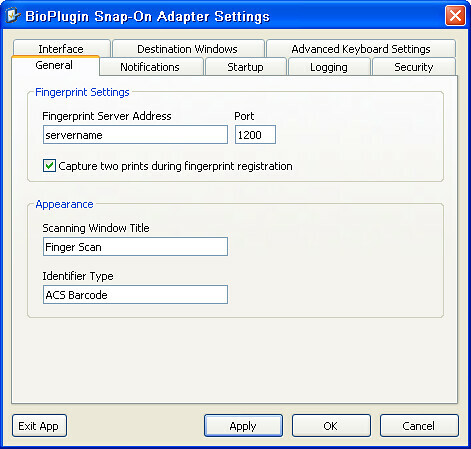 When registering users, Open both ACS Desktop (CheckPoint Tab>Check IN/Out) and BioPlugin FingerPrint Administration. Lookup the individual that you are registering. 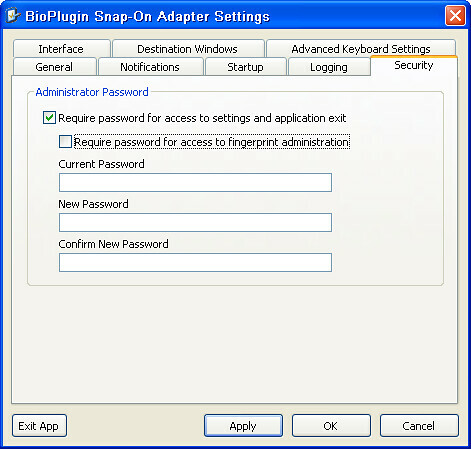 Go to FingerPrint Admin and Paste the barcode into the BioPlugin Screen and proceed with the registration process that was used in the testing scenario above. Once the individual is registered they can immediately visit any other kiosk running Express Check-in and scan their finger and Check-in. If you would like for the Registration Admin to default to a finger other than the middle finger you can edit the client.ini file. Since our first roll out of vein scanning was with Jr. High ministry we elected to change the default finger to the index finger. Right Click on client.ini and choose Open. This post is post 4 in a series of 5 posts on ACS CheckPoint and M2Sys Biometric Scanning. Previously I documented our process of selecting hardware and software as well as installing the server, now I will document Installing & Configuring M2Sys Vein Scanning Client. This part of the installation is to install the application that allows the scanner to work and talk to the database to recall a record and identify a person to the application (in our case CheckPoint). As previously mentioned, the M2sys Vein Scanning and Fingerprint Scanning applications are two separate applications for the related technology. 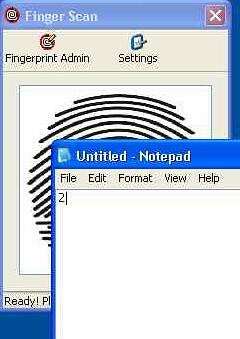 At the time of writing this documentation it is not possible to use a vein and finger print scanners on the same computer concurrently. Although I have been told by M2sys that a combined solution is in development to allow both scanners to be connected to the same workstation concurrently. 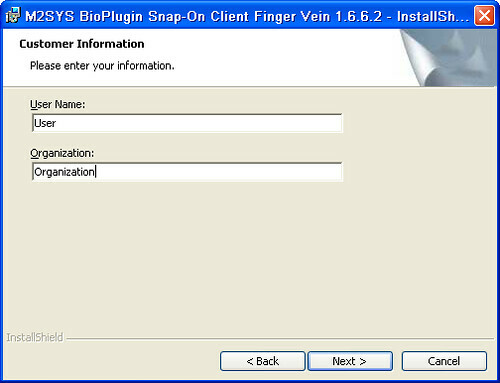 Note: Most steps are identical for Fingerprint Scanning Server and DB but Vein Scanning install requires a different installer than the BioPlugin for Finger Print Scanning. Your mileage may very depending upon your environment, do due diligence before following these procedures. 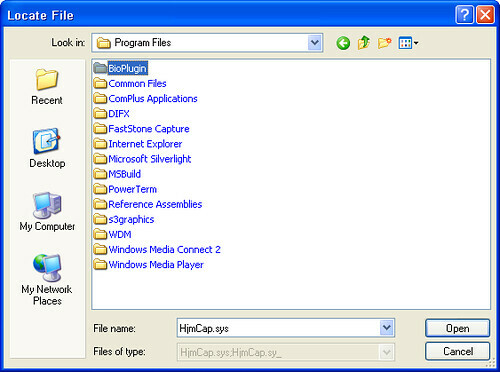 After downloading the installer running it on a XP, Vista, or Windows 7 workstation is fairly standard. This installer does not install the server application and the software will not work without the proper install of the server application. Do not connect the Scanner to the computer before starting the client install process. Connecting the hardware prior to the client install can make the device driver install significantly more difficult. Click Finished when the Install is done. After you connect the scanner you may be prompted to locate the driver. 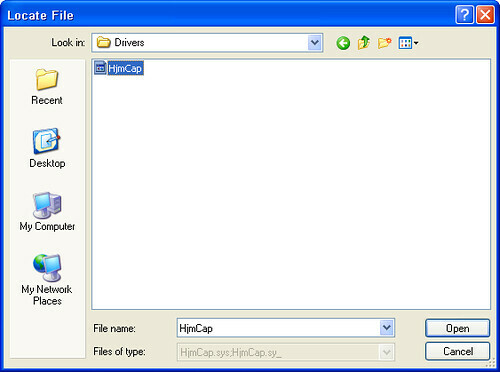 The file will be located in the Installation Destination that you choose earlier in the install process. After you have located the driver the installation process is complete. The next step is to configure the M2sys Vein Scanning Client and ACS CheckPoint. As previously mentioned Part 1 & Part 2 we have deployed M2Sys’ products before and have some familiarity with the products. Even with this familiarity there were a few areas that we had to work thru to get everything working. Our specific install is unique since we will be deploying both Vein Scanning and Fingerprint Scanning on the same network. At the time of writing this documentation, the two technologies are not able to be compatible with one another and require separate installation for independent use. Future updates are expected in the next few months that will allow for one Database install and one client install to support both types of scanning on the same workstation concurrently. Until that is the case the Vein Scanning Database and Finger Print Scanning Databases must be accessed via two separate servers. 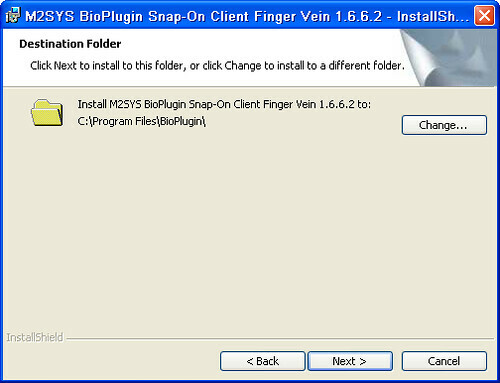 Most steps are identical for Fingerprint Scanning Server and DB but Vein Scanning install requires a different installer than the BioPlugin for Finger Print Scanning. - Install OS On a new Server – Since almost all of our servers are virtual isolation of applications is key. - When using 2008 or 2008R2 as your server operating system disable UAC prior to starting the install of the M2Sys software. If UAC is not disabled before install of M2sys the service will fail. 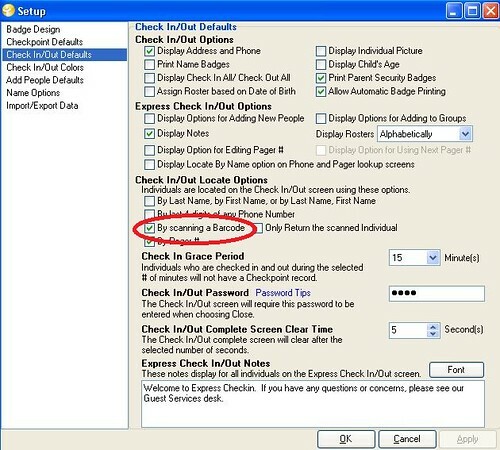 On Server 2008R2 disable UAC by going to Control Pannel>User Accounts>Change User Account Control Settings and change the slider to “Never Notify”. 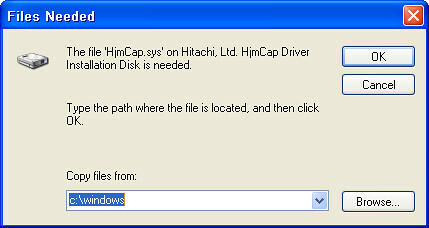 Note: Installing BioPlugin 6.6.1 on a 64bit server the service will fail because the application is making a call to the Hitachi Driver which is only 32bit at this time. Uninstalling and installing 6.6.2.2 resolved this issue. This icon only indicates if the service is running or not. 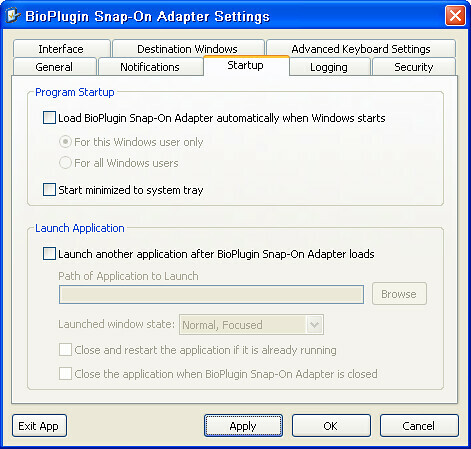 Administration of the BioPlugin is done in the control panel, not the Sys Tray icon or start menu. 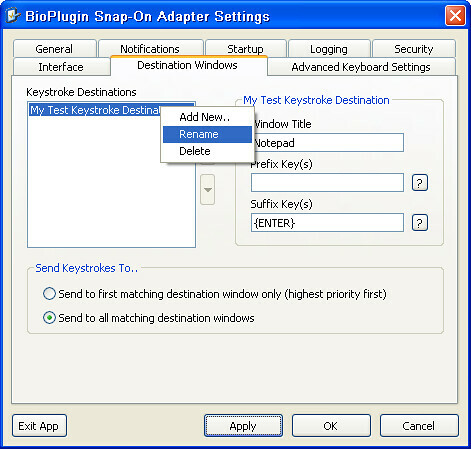 Note: If you are using server 2008 or 2008r2 you will have to change the view of the Control Panel to Large or Small icons to view the BioPlugin control. BioPlugin does not display in any of the Category Groupings. 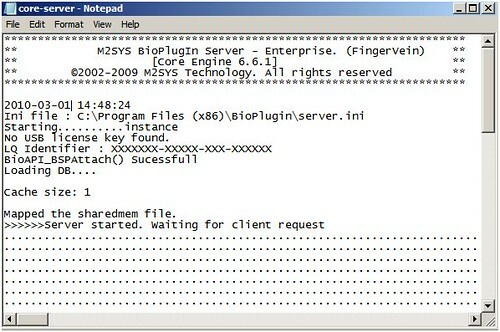 - After accessing the BioPlugin Server Preferences you will need to apply the license key. Do this by Navigating to the last tab “"License”. 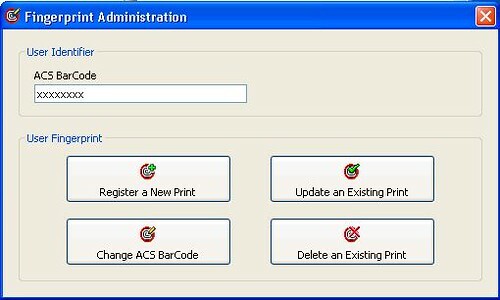 If you purchased the scanners and software from ACS Directly you will need to send your account manager the Installation ID and they will send back a License ID. Enter the License ID and Select Apply. - After you have installed the software and applied the license key you can restart the server and BioPlugin should show green on the little traffic signal. It is possible for the service to try to start and fail and the green will go back to red. This is the first indicator that we were having an issue with 6.6.1 not working on a 64bit server. 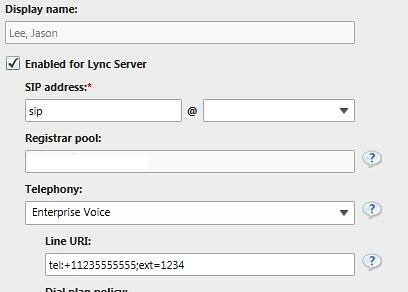 - Check the Service is actually running by going back into the Control Panel BioPlugin Server Preferences and click on View Core Server Log. The Log should display “Waiting for Client Request”. If the service is failing the log file will either not display “Waiting for Client” or when you click on view Core Server log nothing will happen because the log hasn’t yet been created. Note: It is not stated anywhere in the documentation, but Cached Size: # is the number of registered users you have currently in the BioSnapOn Server. - Once you know the service is working locally you have to decide to either keep the database on the server as an access database, which M2sys says is ok for up to 10,000 or point the M2sys server to another database server like MySQL, or MSSQL. Because we already have a backup strategy in place for MSSQL databases and have a server running MSSQL 2008 it was best for our situation to use the MSSQL backend rather than the local access database. Note: In a testing environment the local database worked without any issue. 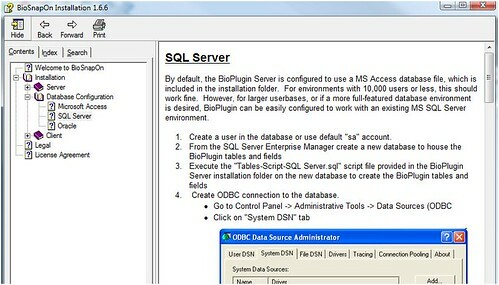 - If you are using a MSSQL database the next step is to create an empty database and user account for the BioPlugin server to use to connect to the database. 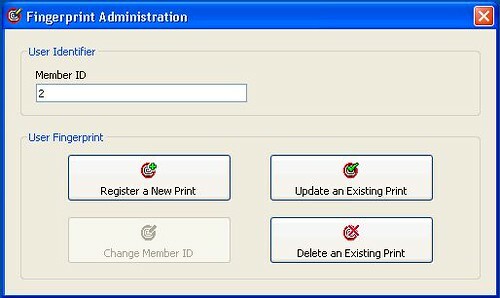 Because we already have our finger print scanning database in production we simply created a new database with the same name and added database–02 to the name. In a dual database setup like ours it is important that the right BioPlugin server be pointing the correct database or your biometric check in with not be successful. You define which database the BioSnapOn Server connects to in the DB string later in this process. - After a blank database is created and the user account is set as the owner you run a script to prepare the database for use by BioPlugin. These scripts can be found in the location on the BioPlugin server where you installed BioPlugin (Default is C:Program FilesBioPlugin). Copy Tables-Script-SQL Server.sql for the MS SQL install locally to the SQL Server. Select the database for the biometrics and execute the script. Once this is done configure your backup of the database. After the backup configuration is done the database is ready. -Now that the database preparation is done be sure the BioSnapon service is not running (make sure the traffic light is red) next launch the BioSnapon Server Administration tool again and Select the Microsoft SQL Server radio button on the Database Tab. This will change the connection string to a template of a SQL connection string. - Connecting the SQL database is a little annoying if you (like me) do not frequently work with MSSQL. But in the latest release the BioPlugin server help files give sample definitions for the connection string. 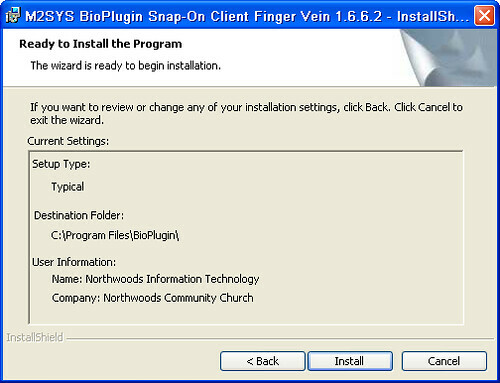 You will next want to review the BioSnapOn Installation Help Guide found on the install CD in the Documentation folder. Navigate to the Help file location: Installation>Database Configuration>SQL Server. This provides settings and options for Using ODBC connection, SA and Windows Authentication. - We had success with MS SQL Server DSN-Less Connection with SQL Authentication and the following connection string. 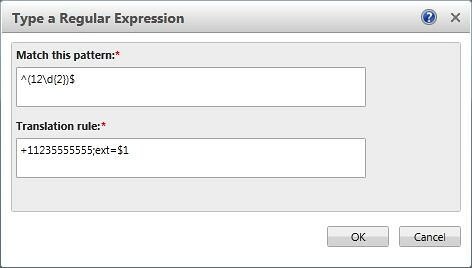 Values have been changed and display what information should be entered for each variable. 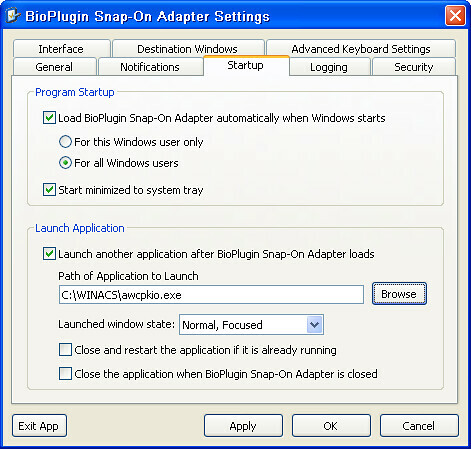 Now you are ready to Install and configuring the BioSnapOn Client on the workstation, point it to the BioSnapOn Server and testing scans. Previous - Part 2: Why Vein Scanning? In the past year we have learned a lot about biometrics and our check-in system and I have had people ask me multiple times a great question, “Would you do it again?”. They are really asking would we use finger print scanners as an key component of our check-in system, and I would reply, Yes. The finger print scanning has been successful to accomplish the two areas we saw concern in the other flavors (bar code, key fob, number/name lookup) of check-in: Security and Speed. The finger scanning has allowed us to have check-in remain secure, limiting the use to families who had followed the registration process and allow them to do it in a process that takes less than 15 seconds per family. 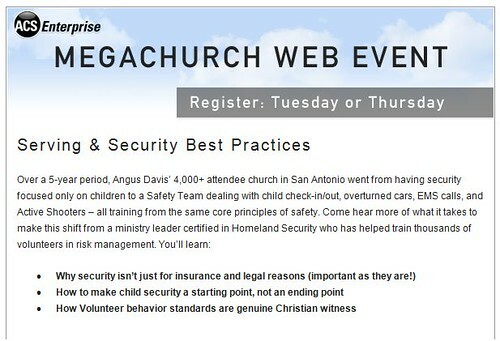 A major positive of the finger scanning over other scanning solutions, the speed isn’t dependant upon the end user remembering to bring a key tag or key fob with them to church. Even saying Yes to that question wouldn’t mean we haven’t learned things over the past year and we haven’t modified the configuration. 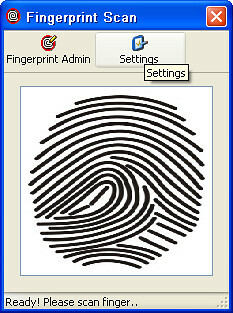 We have learned that finger print scanning is dependant upon indoor and outdoor temperatures, humidity, dry skin, etc. The quality of the scan is affected by more environmental variables than we expected. A second learning point was paying attention to the scans captured at pre-registration. This process is much more important than we originally thought. If attention to detail was paid at the pre-registration process then the success rate increased exponentially. And finally, we were affirmed in our thought that there would be some people not able to use the biometric system because they just didn’t have “good” fingerprints. So with the environmental variables and the fact that some people couldn’t use the biometrics we had to identify a workaround, which was allowing people to check-in by pager number. This is not the security number printed on the child’s tag but rather the number that is used to alert families the DLand staff need them to come get their child. Allowing check-in via pager this did have negative impact on speed and people do forget their number. So when it was time to start planning our rollout of Jr. High and Sr. High check-in we decided to put all options back on the table. Our team came to the conclusion that if we could make finger scanning more reliable it was still the best option. This planning was happening concurrently to the release of a new product by M2Sys called Vein Scanning. Vein Scanning works under the principal that your vein alignment in your fingers is as unique as your finger prints. Allowing you to be identified in a system without the environmental and “good” print concerns noted above. The Scanner uses infrared to ‘see’ your vein alignment in your finger and allows the software to translate that alignment into a string of numbers that can be called back to identify you after you have pre-registered. The solution sounded good but needed to be tested. We contacted ACS and asked if we could put the scanner thru some testing and they provided a demo for us. Our testing showed the Vein scanners to be much higher in accuracy no matter the variables. So why not vein scanning in the first launch a year ago? The products weren’t available a year ago in the capacity they are now. 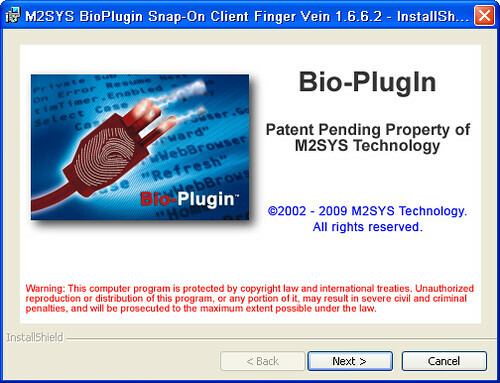 Will you be migrating your finger print users to vein scan users? Not at this time, currently the two technologies are not able to be used concurrently on the same workstation and would require a mass re-registration process for over 1250 individuals. Will you possibly migrate everyone to vein scanning? Once the converged product allowing both types of scanning at one workstation (12 weeks) we might explore this option. Previous Part 1: Why Biometric?